Holy Eucharist is offered at three weekend services and two times during the week. Our worship at Transfiguration embraces the richness of Episcopal tradition by utilizing the beauty and poetry of our prayer book. Grounded on the faith and belief of countless Christians, both ancient and modern, this holy resource guides us as we come into God’s presence seeking his blessing, mercy, and nourishment. To us, The Book of Common Prayer offers a treasure of language with which to speak to God. Our music program further elevates our hearts and minds by filling our services with glorious sound. Led by our world-class Director of Music, Joel Martinson, and oriented around our renowned Opus 17 Organ by Richard, Fowkes & Co., the music at Transfiguration is simply sublime. Our hope in all our services is to glorify God and cultivate in every person a sense of reverence, awe, connection to the Almighty. 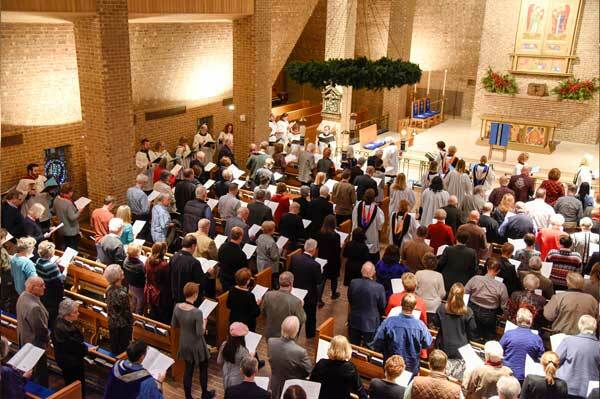 If you are new to Episcopal worship, or are interested in learning more about how we worship (what we do and why we do it), you’re invited to check out this Instructed Eucharist. The Eucharist is the centerpiece of our worship, and the service we celebrate at least five times a week.